atelier le balto are Laurent Dugua (*1967) architect; Marc Pouzol (*1966), landscape architect; Véronique Faucheur (*1963), urban planner, and Marc Vatinel (*1967), landscape architect. The group was founded in 2001 and has its offices in Berlin and Paris. atelier le balto’s landscape architecture ist mostly a minimal intervention, derived from the substance and characteristics of the place – of its special quality. 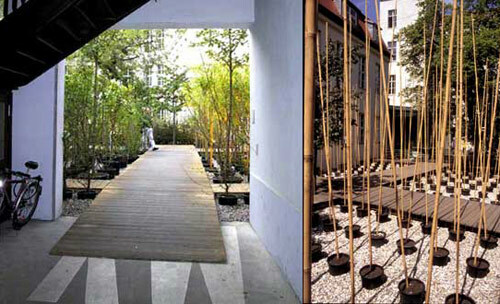 Their temporary gardens create an aesthetics that forms by the on-site found materials and plants. “woistdergarten? / whereisthegarden?”, one of the Berlin projects of the office, is an ongoing series of temporary gardens that each use gaps between buildings, waste land or remaining places on different locations in the Berlin city for a year or a summer.